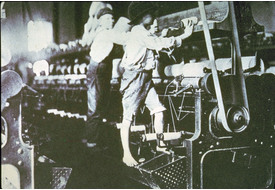 Card Text: Young "helpers" in a Georgia cotton mill. 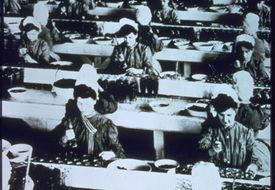 Boys and girls of five or six worked 12 hours a day. 1909. 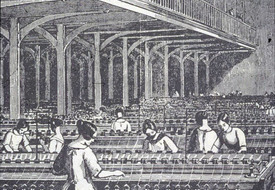 Card Text: Bottling Room, Heinz factory. "A hundred girls [sic] pack pickles, one at a time, into spotless bottles with a wooden paddle, giving the pickles a pattern and inserting one red pepper where it will show nicely. There is little dawdling, for the girls get a penny a bottle, and it thus takes 12-1/2 dozen (150) bottles to bring $1.50, considered to be a good day's pay. Twice a week the girls scrub down the room and hands must be kept meticulously clean. A new girl is given a free uniform; thereafter she makes her own from dark-blue white-striped cotton, which she buys at cost from the company stockroom." 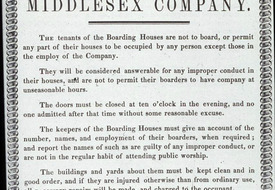 Card Text: W.A. 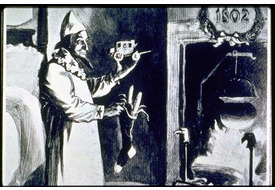 Rogers, Christmas sketch for Harper's Weekly, 1902. It shows Uncle Sam as well-pleased by his growth during the past hundred years. On the Christmas tree are a car, telephone, tall buildings, trolley, ship, oil rig, camera, train, and bags of gold underneath. 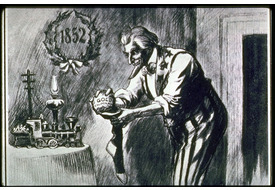 An American Heritage quotation of Dec. 1976 reads: "We here reproduce Harper's Christmas greeting of 1902, wishing you the best of the season, and in the hope that Americans will sometime again be as proud of what they have wrought." Citation: Harper's Weekly's Christmas cover, 1902. In American Heritage, Dec. 1976, p. 77. 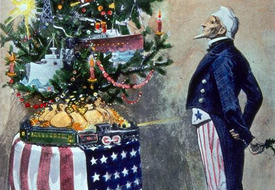 Card Text: At Christmas in 1852, Uncle Sam is shown with California gold and a small train and telegraph pole. See the companion piece, SY-U-22. Card Text: National Guardsmen firing into an angry mob of demonstrators during the Chicago Pullman strike of 1894. Drawing. Citation: Harper's Weekly, 1894. In Eds. of American Heritage, An American Heritage Pictorial History of the Presidents of the U.S., Vol. II, 1968, pp. 572-3. 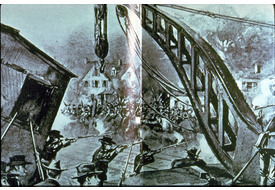 Card Text: The Pullman Strike, Chicago, 1894. 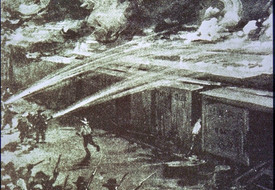 A fleet of boxcars, set ablaze during the Pullman strike, burns fiercely in a Chicago yard. With rail traffic snarled, supplies dwindled and a meat famine threatened the Midwest. Citation: In Eds. of Time-Life Books, The Life History of the United States, Vol. 7, 1974, p. 93.